While looking at the moon as presented in the sample application, I thought: “wouldn’t it be fun to be able to get into it and then find a friendly landscape to explore”. What we need for this is a so called Sky Sphere, and a moving camera. A Sky Sphere consists of a cube which faces are textured with a coherent set of 6 images. For instance, the 6 connected images resulting from taking a photograph into each of the 6 orthogonal directions, starting at the horizontal direction facing north. Within this cube is a sphere, and the inside of this sphere is textured with the cube textures by means of extrapolation of positions on the sphere onto positions on the cube. Then, within the cube you see the seamless projection of the cube’s images. This technique is used to provide an environment; it is also called environment mapping. The idea is to move the sphere and cube with the camera so the sky sphere always presents a distant environment. In the current version we have not yet set the step to always keeping the environment distant. At this point we want to be able to travel through the moon, to, into, through, out and away from it. 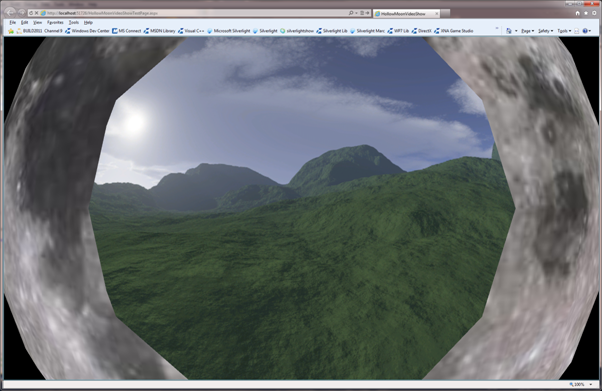 The XNA Sky Sphere Community Sample served as a starting point for development. The advantage of the ArcBall camera is that it has a large number of properties and many degrees of freedom. It therefore has a broad spectrum of applicability. On the other hand, the code is complex, and in any particular application it holds a lot of code you don’t need. Also it is hard to keep it leveled straight. Somehow I always managed to get the view somewhat tilted, but never managed to get out of the tilt. So I looked a bit further. The Particles XNA community sample contains code for a typical orbit camera. An orbit camera can move around its LookAt, even zoom into it. This camera lacks the capability to move around freely, that is, to change, or control, the LookAt. So, we will need not one, but two camera’s, one of which will be this orbit camera. The Chase Camera is another XNA community sample. In the sample the target is a ship. In our project we do not have a visible target. The target is just the LookAt. Typically, the target, or LookAt, is what you control with the keyboard or game controller, the camera just follows the target. The target can also be controlled using the mouse. Instructions for controlling the chase camera can be found in the section “Sample Application” below. What you control defines the major difference between a chase camera and an orbit camera. In the former case you control the target, and in the latter the camera (while the target remains stationary). One could easily create an integrated camera that switches between orbiting and chasing. For now, I’ve adapted the chase camera to fit the needs of this application, as described above. To port software from XNA to Silverlight 5 does (still) require real work. The first task is to split up the Effect file into separate shaders. One file for each vertex shader and one file for each pixel shader. Since we have an inside and an outside to draw, we end up four shader files that have to be loaded separately. The same holds for the .dds file that holds the image set for the environment map. The set had to be split into 6 separate file that have to be loaded individually. At first I couldn’t find a way to load the Silverlight 5 textureCube into the shaders. But at some time I found that the TextureCube is a subclass of the Texture class, hence can be assigned to the textures collection of the GraphicsDevice which will then load it into the shaders at runtime. We want to control the pitch (vertical angle), yaw (horizontal angle) and thrust by means of keyboard (and mouse, but see below). So, mouse and keyboard events set a variable that indicates that a change in angle is required. The mouse and keyboard events happen on the UI thread. The Draw event happens on the Composition thread. In order to prevent synchronization problems, we want to prevent (re)setting the yaw and pith variables on this thread. In order to prevent both synchronization problems and loss of performance as a consequence of using locks or wait states, we set e.g. the pitch variable in the KeyDown event handler (for the Up and Down keys), and reset it in the KeyUp event handler. The Draw event handler only reads (samples) this variable. In the RC (release candidate) version of Silverlight 5, the DrawingSurface and e.g. the Rectangle do not raise keyboard events. The Textbox, however, does. On the other hand, the DrawingSurface and the Rectangle do raise mouse events, but the Textbox doesn’t. Also, these events do not seem to be routed events, that ‘bubble up’, yet. So we have to choose between mouse input and keyboard input over the DrawingSurface. For this application I have chosen keyboard input. We use a transparent Textbox, stretched out over the DrawingSurface to raise keyboard events. Before the TextBox has the focus, we first have to click it. We use a startup message that has to be clicked away as a work around. It might well be that the left and right arrow keys respond only after a while. This does not hold for the up and down arrow keys, or the space bar. Reason unknown. Remark on the render system: at the edges of the drawing surface, the shape of the moon gets distorted – flatted out to an ellipsis. This turned out also to be the case for the XNA version; something to look into. The sample application demos the moon interior and the chase camera. And that’s it. Edit 29-12-2011: Since the Release of Silverlight 5 RTM some changes were made to the sample program. There is no startup message any more. On the other hand, the application only runs after local installation.